The last day being on the Greene Team has snuck up. It feels like just yesterday I was becoming acquainted with other team members. The progress I have made in five days is astonishing. Learning from journalism professionals has made me a better journalist and more interested in blogging. It has really been an amazing experience overall. The food was good, an unpopular opinion, the professors were helpful and respectful, and I made lifelong friends with whom I’d love to keep in touch. Being surrounded by aspiring journalists has been nice because we can talk about our future and interests. I wish I could do this program again next year, but I hope to come back as a student at Stony Brook University rather than a student on the Greene Team. Although I’m sad to leave my friends and professors, I’m excited to go home and teach my friends writing techniques and tips I have learned this week. Also, I can’t wait to show my parents all my pieces I have been working hard on. I want to impress my family members and friends with my writing and journalism skills because I want to show them how serious I am about journalism. Even though I am leaving my new friends, I plan to have reunions with them somewhat frequently. It’s going to be weird not waking up and getting ready to go out at 7 a.m. on about six hours of sleep with the girls. Surprisingly, I might actually be a little upset I won’t be waking up so early and working for over twelve hours a day. I am so passionate about journalism; it doesn’t even feel like one hour. Time flies and it’s not okay with me. I know for sure this will not be my last journalistic experience, and hopefully not my last journalistic experience at SBU. My goal at the beginning of this week was to hone my writing and editing skills. I think I mastered the skills I wanted to and completed my goal, which makes me feel satisfied and accomplished. I will miss taking panoramas and asking professor Ahmad if he can make my panoramas 3D. I will miss giving Noelia Vazquez a hard time whenever she spoke. 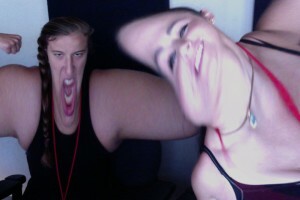 I will miss taking ugly pictures on Photo Booth with Lisa Angell when we finish our work. I will miss everything about this program and it’s heartbreaking that I have to leave tomorrow afternoon. Positively speaking, this experience was life changing and I will use the tools and techniques learned for the rest of my life. I’d like to thank everyone who made this week fantastic. 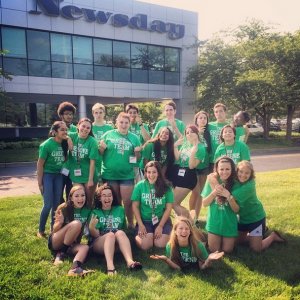 The institute, which runs from July 20-26, is named after the late Pulitzer-prize winning Newsday reporter. You can see the video, photos, stories and blog posts from the students at this year's camp on this site. Without help from the Press Club of Long Island, Newsday, Friends of Bob Greene and New York Community Bank Foundation, this institute would not be possible. Thank you to everyone who helped.